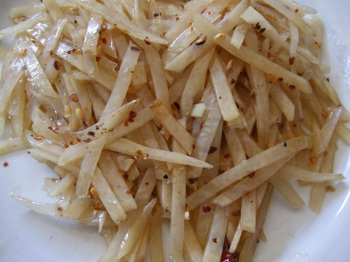 Sichuan Stir Fried Potato Strings - mmm-yoso!!! We decided to just hang around the house this weekend, I'm a bit tired, and it is just too hot...... We didn't even feel like going to the market, so we decided to just eat what we had in the frig and lying around a la Charsiubao. Problem was, we didn't have much.........just some leftovers, and 1 lonely potato. So what to do with a potato? I decided to make Sichuan Stir Fried Potato Strings. If you're not familiar with this dish, it may seem a bit odd......potatoes and Chinese cuisine would seem to be a bit of a leap. I thought so myself when I first saw this on a menu several years back. It was on the menu in a Shenyang restaurant in the San Gabriel Valley. I ordered it, and the Missus thought I was nuts. She told me, "you know this is just poor people home style food, right?" Being the carb lover, I enjoyed the texture of crunchy stir fried potatoes and the flavor of the sour vinegar and spicy chilies. After that I started noticing the dish on the menu off most Sichuan restaurants in the area. In Sichuan restaurants, the potatoes are served and eaten as a stir fried vegetable....in other words, it is consumed with rice! You gotta love that! So here's the version I made tonight. I used Chinkiang Vinegar because I enjoy the flavor, but if you want the potatoes to be a bit more attractive you can use white vinegar. The taste will be a bit different. Also, many Sichuan restaurants will not use vinegar, but the Missus, being from Sandong, loves vinegar. I love the numbing heat provided by the Sichuan Peppercorn, most restaurants will use whole peppercorn, but I enjoy using peppercorns that I've roasted and ground....it provides a nice numbing effect. Think of the dish as being a ma-la(numbing hot) version of Salt and Vinegar Shoestring Potatoes. As always, it is a pretty easy dish......I really don't make anything too difficult. Heat wok over medium heat, drain potatoes well. Add 2-3 Tb Oil to wok, and swirl around, add red chilies and if using whole Sichuan peppercorns add it as well. Once you can smell the fragrance of the Sichuan peppercorns and chilies, add the potatoes. Stir fry the potatoes for 3-4 minutes then add the sugar and vinegar. When the potatoes are cooked and al dente in texture, taste and add salt if necessary, remove from heat and add sesame oil if desired. I also had 3 large cucumbers, so I decided to do a really quick pickle. 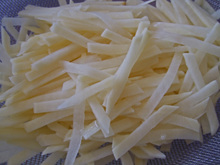 Peel cucumbers, and slice in half lengthwise. Scoop out seeds using a spoon, and slice in thin "half-moons". 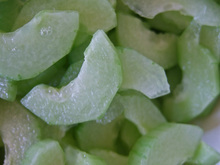 Place cucumber slices in a bowl, add salt and sugar, mix, and let stand for about 1 hour. Combine vinegar, sugar, soy sauce, garlic, a dried red chilies is a small pot, and simmer until sugar is dissolved. Set aside and let cool. Once liquid is cooled, drain slices of cucumber well, and add to liquid. Chill for at least 2 hours. Serve with Sichuan Pepper-Salt. This pickle is best eaten the same day. Roast salt-peppercorn mixture over low flame until fragrant. I always know that my Sichuan Peppercorn are ready when they start to "pop". Remove immediately from heat, and grind. I hope everyone had a great Labor Day weekend. We'll be back with more restaurant posts tomorrow! "1 lonely potato" = a la charsiubao. ahahahahaha, so true. I'm totally making those pickles. By the way, I am the travel writer looking for road food on chowhound. I loved your idea of looking for the semis - can you contact me? I'd love to quote you in my column. I'd give you a link to here, if you like. "you know this is just poor people home style food, right?" That's funny, it reminds me of a friend who refuses to order vegetables at restaurants since she knows that she can cook the same dish at home for less than a dollar. It looks very tasty though! I'd pay for it. Hi, Kirk- Stir fried potatoes and rice...today...you do know it was 108 with a heat index of 116 in Santee, right? Although in a few weeks, it sounds like something I will totally make and eat. Hi, Mrs. Chicken-I'll write to you soon. Hey Kirk! One of my all-time favorite "poor people home style food" is chicken tu dou si over rice. My grandmother's recipe contains no peppers but it's so good. Not sure if I can handle the heat in this weather. Don't think I've ever seen this in any restaurant. I would probably order it just to see how it's prepared, tho. The pickled cucumbers sounds really good! I'll have to whip up a batch the next time I make some kalbi. Thanks for the recipes! hello kirk, that looks great. i've actually thought about substituting fresh ground black pepper for sichuan peppercorns. there's a good posting on infusing salts w/ sichuan peppercorns on steamy kitchen's blog. Hi MrsC - I've forwarded your info to Cathy, she'll be in touch! Hi Howie - I've had the version at Ba Ren, it's not bad. Hi Cathy - This is pretty quick....so it was relatively painless. Hi Carol - Boy has it been hot. As for the pickles, it's kinda easy to make adjustments after the first time you make them. Hi EDBM - I dunno....it'll be a totally different dish if you substitute black peppercorns for Sichuan Peppercorns which are the tiny fruit of thePrickly Ash tree. It might end up just being like the stuff on salt and pepper dishes.... I did check out SK's post, looks very nice, Matcha-Shio is already something I use for tempura. I was very pleased to see that what I make is very close to Kylie Kwong's recipe. Almost makes me feel like I can cook! I've never noticed the potatoes at Sichuan restaurants. Will have to keep my eye out for it now! I've had the Japanese raw potatoes. A little slimy, although interesting. And I've had Chinese raw potato salad that was quite refreshing. What a way for me to return to food blogging! I came back and I saw these food posts about you COOKING again! Yea! I am always happy to read about you or the Missus in the kitchen! Hi PE - Yes, I'm trying to do a bit more cooking....I hope it doesn't bore anyone! Thanks (as always) for the kind words. Funny, I just made this the other night. The wife had some potatoes left over from her seafood chowder (ymmy), so I used it for this dish. I get love it or hate it reactions from family and friends. I love the carbs and the surprising texture as well as all the heat and hua jiao goodness. I remember having a dish like the stir-fried potatoes a long, long time ago in a noodle shop, but I have forgotten about it until I saw your post. Thanks for the recipe. Might try it one of these days. It's a rare Chinese dish -- at least in my experience -- that features potatoes and only potatoes. This is _ts of [eatingclub]vancouver. And yes!!!! This *was* the dish we ate at that noodle shop! I've tried asking people about it but nobody seemed to know what I was talking about. Hi JS & TS - This is really easy to make - the key is the vinegar and peppercorns. Please let me know how it turns out! Awesome! I just made a version of this-- LOTS of vinegar is key. I'm so glad people in the U.S. make things-- too often potatoes are dismissed as starchy. There's no reason why they have to be reduced to mush or fried. This is one of my kids favorite dishes from when we lived in China. They will be so excited when I serve them this tonight! We really miss the home cooking of our friends there and I really wished I learned to make these simple home dishes while I was there. What I wouldn't give for some fried egg and tomato! Hi Roxie - I'm glad you can find use for this recipe. Please let me know how it turns out. Make sure to adjust the vinegar, salt, and spices to your taste. Good Luck!